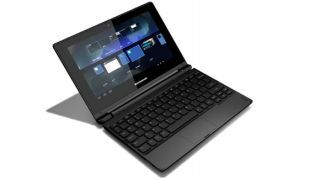 Lenovo has made thin and light laptops by way of ThinkPad and IdeaPad computers, but now its hardware is going to sport an equally lightweight operating system by way of an Android notebook. The Lenovo A10 is a 10.1-inch convertible laptop with a touch-enabled screen that can be flipped around 300 degrees. The 1366 x 768 HD display is therefore optimized for Google Play store apps and all forms of entertainment. In addition to a its "stand mode," the dual-form A10 can be put into a "fold-back mode" that prevents the usual shaking and bouncing that comes about when using a 10-point multi-touch screen. Lenovo revealed through a press release that its budget-friendly notebook contains an RK3188 1.6GHz quad-core Cortex-A9 processor inside. The company boasted that it's the highest frequency for all quad-core ARM-based CPUs on the market. The A10 also has 2GB of RAM and 32GB of internal storage, according to The Verge, and its battery is supposed to last up to nine hours even with video playback when it comes out. That's the real question, though: When is the A10 release date? Lenovo hasn't gotten back to us regarding its exact timing, but did mention that it will be sold in Europe, Africa and Asia Pacific countries to The Verge. It'll be sold for the equivalent of $240 (about £148, AU$148), but won't make its way to US shores just yet. Instead, if you want an Android-powered laptop in the states, you'll have to turn to something like the Asus Transformer Book Trio.